How are we a part of the trafficking demand? The Charity: CCAT is a registered charity fighting human trafficking in the borough of Croydon and now, due to our success in raising this issue successfully in Croydon, through our model YCAHT (Your Community Against Human Trafficking) we help start and develop other community anti trafficking groups in their areas. Where: Various locations: Your home and in your local community. Plus access to our Croydon office. Commitment: We are looking for volunteers who can help regularly, occasionally or on a one-off basis. Opportunities are flexible and varied based on whatever time and skills you can offer.We are keen on finding volunteers from other areas in the South East so that they can establish similar anti trafficking groups where they live. Roles: Modern Slavery Education Campaigner – We are seeking volunteers to join our trained team of presenters to work with schools on a regular basis delivering presentations to young people, to raise awareness of modern slavery. We train our Campaigners on the issue of modern slavery and trafficking locally and nationally. Intelligence Gathering Officer – Volunteers are trained to investigate dubious establishments where trafficked people may be exploited via newspaper ads, the internet and shop window ads. The resulting information is carefully compiled and shared with the Council and local Police. Is this something you could do as part of the team and maybe develop under our YCAHT model? Fundraising – Do you have a talent or idea for fundraising? Whether you bake, swim, skydive, run, walk, sing or cycle we would love to have your support. Our volunteers have raised thousands of pounds for us in the past doing all sorts of creative things from sponsored stiletto walks to theatre performances. Have a look through the site for some examples. 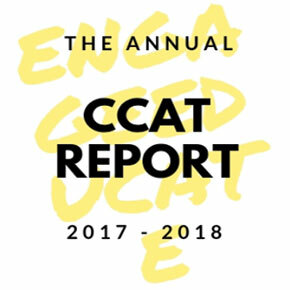 What’s In It For You: A chance to assist CCAT with high priority work. Good opportunity to improve campaigning skills, increase knowledge of local trafficking issues and meet new people who are passionate about campaigning in your community.CCAT is an active and exciting charity, recognised far and wide from local government authorities to the United Nations! We can help you gain skills and give you a valuable insight into our work.This is a good opportunity for people who want to gain experience in the charity sector. Why We Want You: We rely on the activities of our volunteers to sustain CCAT; as a charity our efforts are entirely voluntary and supported by donations and contributions.If you are self-motivated, organised, reliable and enthusiastic about eradicating human trafficking in your community then we would love to hear from you.We will provide training for schools and advocacy work where appropriate. There are many ways people contribute to our organisation, whether part of the community or through networks of other organisations or charities. We have a growing membership database of members in Croydon, and we regularly hold events throughout the year organised and sponsored by our volunteers. 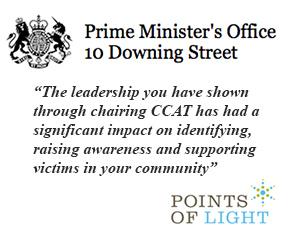 The Croydon Community Against Trafficking (CCAT) is a registered charity (no. 1141863) whose aim is to stop the injustice of human trafficking primarily in the borough of Croydon, but also, through its model Your Community Against Human Trafficking (YCAHT), provides support and assistance to other anti-trafficking community groups across London and to other parts of UK.